AquAid’s Bottled Water Cooler goes Viral in peppy Vevo Music Video! Just when you thought AquAid were all about the staid and serious supply of a quality range of water coolers and water related products, we show that we too, can be frothy and fun. How, you may ask? Well, our Free Standing Bottled Water Cooler is a music video sensation! 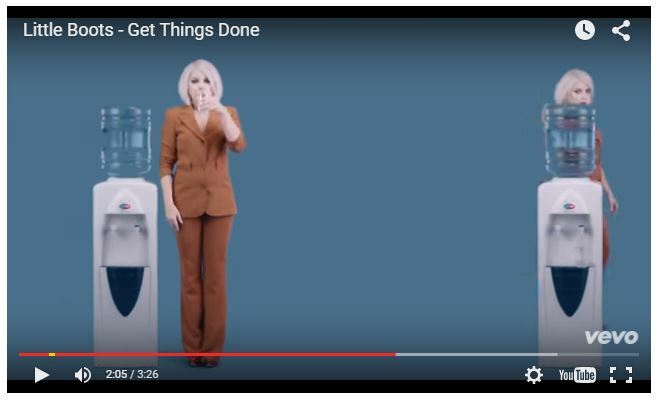 The song, Get Things Done, by British neo-disco songstress, Little Boots, features the AquAid Bottled Water Cooler as part of her fizzy interpretation of office culture. The water cooler features at 1:53 and again at 2:03 – fame at last, AquAid Bottled Water Cooler, fame at last! All thanks go to Steve Norley and the team at AquAid London Central for the supply of this water cooler (complete with bottled spring water, naturally filtered at the source in the Purbeck Hills) to the music video team who put this video together.